Preheat oven to 350F (175C) and lightly grease/spray a 9x9 pan. In a large, microwave-safe bowl microwave your butter until melted. Stir in cocoa powder and sugar. Stir in water and vanilla extract. Add eggs and egg yolk, stirring until combined..
Gradually add to butter mixture until completely combined. Break/crush 12 Oreo Cookies (do not completely grind into fine crumbs, I placed them in a Ziploc bag and smacked them with a rolling pin until they were broken into pieces) and fold into the batter. Layer about half of the brownie mixture into the bottom of your prepared pan. Evenly spread peanut butter cups over the batter, gently pushing down so they are snug. Spread the remaining half of the batter on top. Crush your remaining Oreos and sprinkle over the top of the batter. Bake at 350F (175C) for 35-40 minutes (the toothpick test is difficult to do here due to the peanut butter cups -- the best way to tell that these are done is to look for set centers that have firmed and the center should feel somewhat set and not liquidy to your fingertips). 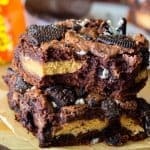 Peanut Butter Oreo Brownies https://sugarspunrun.com/peanut-butter-cup-oreo-brownies/ Find more great recipes at SugarSpunRun.com!